History of The Oregon Trail – iDallas! 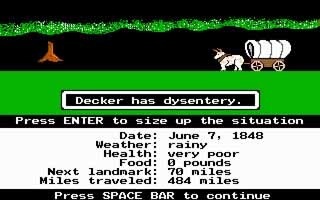 If you attended school in the United States in the 80s or 90s there’s a pretty good chance you played The Oregon Trail video game at some point. The game was simple by today’s standards but it was still much better than class! You had to help a group of settlers through the Oregon Trail hunting, dealing with disease, and dealing with other problems that would come up. A company called MECC (Minnesota Educational Computing Consortium) was the original developer of the game. It was started by the state of Minnesota and originally the game was only available to schools there. Eventually they branched out and offered it to schools nation-wide. The history of the company from the early 1970s on is pretty interesting and worth a read (it’s pretty short) if you have any pangs of nostalgia over The Oregon Trail. i’m sorry to have to post this here, but there is no email address. you can delete it as soon as you read it. blather is being spammed. how is this possible? i cry out to a blather_god for help. please do. you can contact me too if you want. you have my email. if there is anything i can do. howdy Dallas, I was a classmate of yours at HMC for one year waaaay back in the day, lovely to see you’ve made a good thing for youserlf. Oregon trail was pretty much my favorite apple game for years, so much so that when my mother finally retired the Apple IIE from her 1st grade classroom (1982-2005), I jacked it, complete with color monitor and oregon trail floppies, and have been preserving it for my daughter, who’s now 7 months old. I figure a computer on which one can learn to program and smear peanut butter with relative impunity is the perfect machine for a toddler. Thanks for reviving those memories earlier than I’d intended. Somehow, I was able to play the original game on my Mac in college in the 90s, pre-Mac OS X. I think I found the game on the web. I don’t remember if it was via an emulator or what, but it pretty much looked and worked exactly as it had back on the Apple IIe computers in my elementary school way back when, including the MECC splash screen.